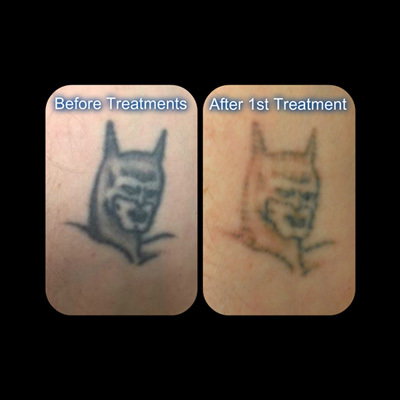 Remove a tattoo, or in fewer sessions, lighten a tattoo to the point that an artist can do their magic. Rewrite your personal journey. Schedule now. A tattoo can last a lifetime, but the reason you got it may not. When you no longer enjoy a tattoo it can feel like you’re branded with another person’s keepsake. You’ve changed, and a tattoo can be a constant reminder of a different time and place. You’re ready for tattoo removal, and RediMedi Laser Skin Clinics is here to help. Not sure how it works? Come in, and we will explain everything there is to know. We are transparent about the lasers we use, and our fully-trained and experienced technicians can give you advice on the best treatment plan for your specific tattoo. 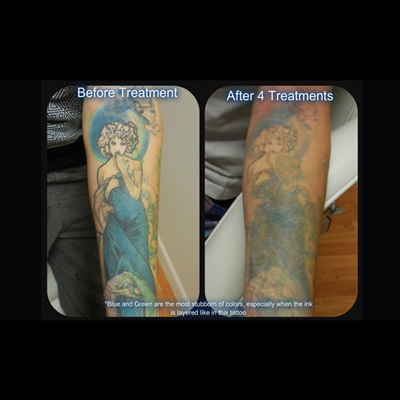 Advanced laser technology, in the form of Q-switched and nanosecond lasers, safely penetrate the skin and target each tattoo ink color with specific wavelengths, causing tattoos to gradually fade during a course of 3 to 15 treatment sessions. 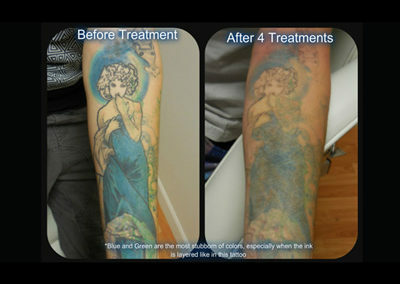 Prepare your tattoo for a coverup without Full-Color Spectrum Lasers. Removing a tattoo isn’t always the end goal. 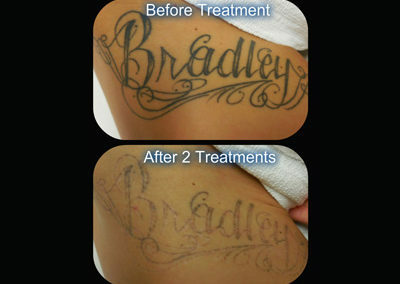 A tattoo coverup is much easier to accomplish after it has been lightened. Our technicians are trained to use a Quanta Q plus C, which is the only FDA approved tattoo removal system that can treat the full-color spectrum. We can prepare your tattoo for a coverup, making it easier for your tattoo artist to create a work of art you can fall in love with all over again. Watch us literally erasing this tattoo. It’s amazing. We’ve helped hundreds of people erase the past. Read what they had to say, in their own words, about RediMedi. *Results vary by skin type, size, color, and age of tattoo. Come in for a Free Consultation where we can help determine how you can get the best results. If you’re interested in tattoo removal, I can’t really recommend RediMedi enough. They have great prices, the work is top-notch, and everyone is not only nice but knowledgable! The staff is kind, supportive and knowledgeable. 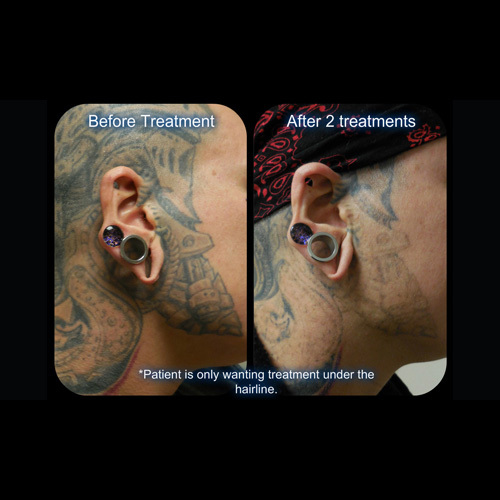 The process of having a tattoo removed is challenging, but the technology makes a world of difference. I absolutely love this place! It’s comfortable they laugh with you and make you feel like you are listened to about exactly what you want done. Absolutely recommend for tattoo removal like mine! My husband got his first round of tattoo removal here a month ago and it was great! He doesn’t have yelp so I’m posting this for him. The staff were super helpful and were very experienced. We had Jessica as our technician and she made him feel very comfortable even though it was somewhat painful. We are definitely going back for more treatments to finish up the series! I don’t know if it’s just my husband but the healing process was very short and easy. They gave us tips on how to make sure he got the best results possible with aftercare. Highly recommend this place to anyone who is looking to get a tattoo removed! I had know idea what to expect, but after they talked me through everything I felt I was in great hands. I really can’t say enough how they are helping me out. I’ve been coming here about a year and having sessions every couple months for some large area removals. These folks are great! Steve is very easy going and helpful, Jamie does very good work and is really informative. The pricing is very good and I feel like I get my money’s worth every time. I’m really happy that i can get clear out old tattoo baggage and have a fresh start. Yep, I’ll be getting new ones! Thanks RediMedi! Call us now to take the next step in your journey. Whether you’re removing it or preparing for a coverup, a free consultation with RediMedi Laser Skin Clinics your next step in life’s journey. One of our technicians will answer all of your questions, walk you through the process, and let you know what to expect from the tattoo removal process. A new you starts today. Call our medical spa in Portland now. Understanding the skin and how it works pretty simple. The skin is the larges organ in the body. It is made up of two layers, the epidermis and the dermis. These layers are your body’s protective layers. Every 2-4 weeks the lower cells move to the surface and slough off your body. As you see right below the layers of the epidermis, lays the dermis. The dermis is where the ink is placed. When an amateur completes a tattoo, a lot of the time they will not go as deep as the dermis and the ink will exfoliate off with the dead skin from the epidermis. When done properly, the artist applies a good amount of ink at the accurate depth in the dermis or deeper to ensure that it is permanent. The density, quality and depth of the ink deciphers how many treatments will need to be performed and there is no one of knowing until you start treatment. 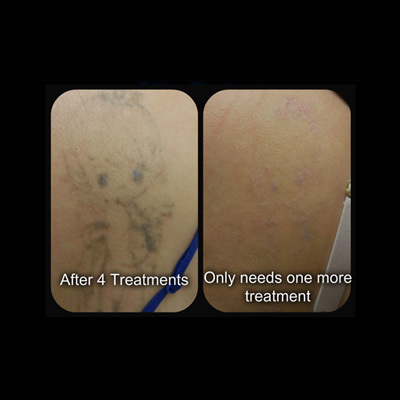 • the Q-switched Nd: YAG 1064nm laser which when used in conjunction with each other enables our clinicians to remove all colored tattoo pigments. At RediMedi Laser Skin Clinics we also use our state-of-the-art Cyro cooling system. This system reduces the thermal temperature of the skin prior, during and after laser treatment. The majority of our clients have found that after receiving an initial test shot, they did not require the topical anesthetic that is also available at out clinic. Following treatment, our clinicians will apply an antibacterial ointment and Tegaderm to the treated area. We would like you to keep this on for 4-6 days for proper healing. If the Tegaderm fills up with blood or liquid, you may cut a tiny hole in the Tegaderm while in the shower to drain the liquid. We suggest you place a small piece of tape over the incision sight in the tape to ensure no more liquid will drain. You may also replace the wrap if you feel the need but in total the Tegaderm should remain on skin for 4-6 days. Make sure you use a barrier of some sort on the tattoo so the tape doesn’t stick to the skin on the tattoo and peel it off, for example if you have blisters and you don’t put a barrier, it could tear the skin off with the tape. This will cause an open wound which can introduce infection, could cause scarring and will take a lot longer to heal. We also provide our clients with detailed Aftercare Instructions to take home. Clients should avoid direct sunlight on the treated area or use a 30+ Sunscreen, and keep the area covered if out in the sun. The area should also be kept clean with the continued application of antibacterial ointment or calendula. Avoid hot showers for 48 hours after treatment and the area should not be scrubbed. Your skin might feel slightly sunburned for a couple of days and may remain red for a few weeks. You might also form a blister or scab. Blisters should never be punctured; they should be allowed to reabsorb into the skin. Scabs should also be handled gently and not be picked. By following our aftercare instructions you will help eliminate any chance of scarring. Once healed, your tattoo will gradually and continually fade. Side effects of laser procedures are rare and most likely will clear on their own but may include hyper-pigmentation, hypo-pigmentation, possible infection or scarring if aftercare instructions are not adhered to. RediMedi Laser Skin Clinics, we see clients who want to have their tattoos removed completely or just lightened enough to get that perfect cover up tattoo. All our technicians are experienced, trained and certified. 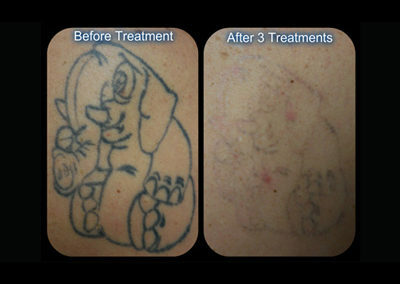 You can trust knowing you are in the best hands for laser tattoo removal in Portland. Take a look at this before and after. Using the Quanta Q plus C Laser, we can achieve either complete removal, or in fewer sessions lighten a tattoo to the point a tattoo artist can do their magic. 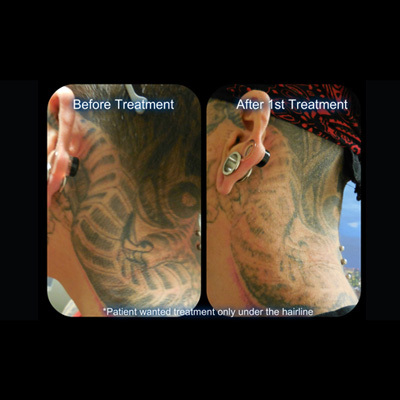 The Quanta Q plus C laser is the only FDA approved tattoo removal system that can treat the full color spectrum. 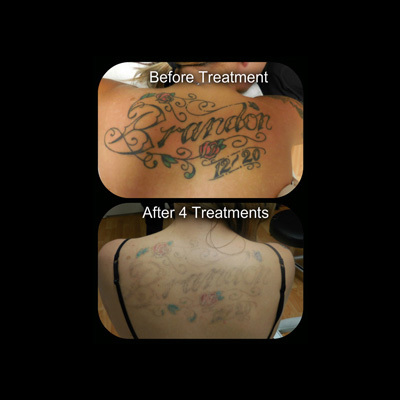 It’s an advanced laser that is specifically designed for tattoo removal of all colors. 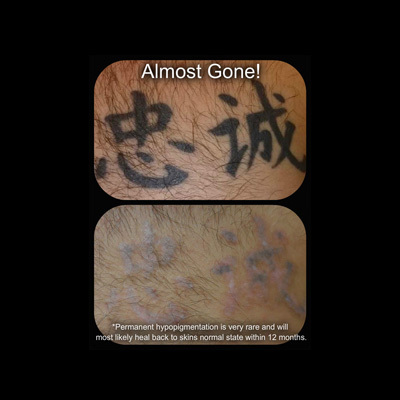 When getting tattoo removal be careful where you go as many lasers our competitors use are made in China and are not FDA approved or not the right type to remove tattoo ink. It is important to be sure you are being treated with a Q switch or faster laser, and that the wavelength is appropriate for the color of ink being removed, and that the technician knows how to use the lasers appropriately. 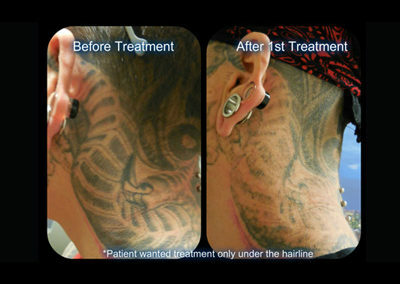 Our Lasers are manufactured in the USA by Quanta and are FDA approved for the removal of tattoos. 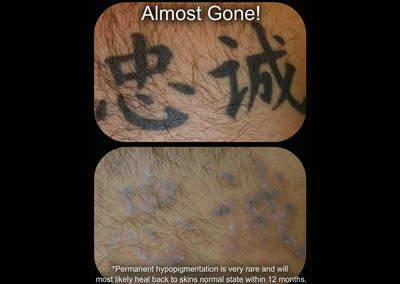 The Quanta Q + C is the “Gold Standard” in laser tattoo removal. At RediMedi Laser Skin Clinics we also use our state-of-the-art Cryo cooling system that reduces the thermal temperature of the skin prior, and after laser treatment. The majority of our clients have found that after an initial test shot, they did not require the topical anesthetic that is also available at our clinic. There are a number of factors that will influence the assessment to determine the number of sessions a client will need. These include the ink density, Color of ink, location, age of tattoo, homemade vs shop ink, age and what skin type. A black tattoo that is 10 years old located close to the heart on a healthy, young patient will take fewer sessions, while someone with newer more colorful tattoos can take up to 15 sessions. 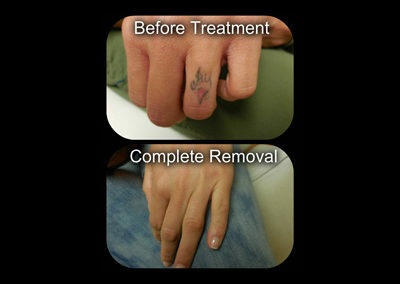 For a free consultation call us today or visit our website to learn more about laser tattoo removal in Portland Oregon. 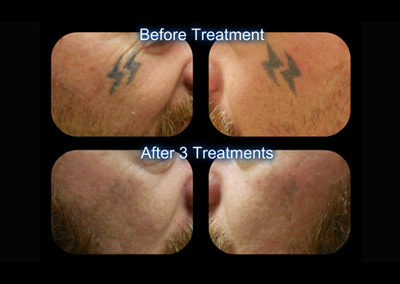 How does tattoo removal work with the Quanta Q plus C laser? The Quanta Q plus C laser is a Q-switched laser that transfers energy through the epidermis and into the dermis where the ink lives. The high energy pulse is measured in nanoseconds or one billionth of a second. It is so fast that it harmlessly passes through the epidermis without causing thermal damage. 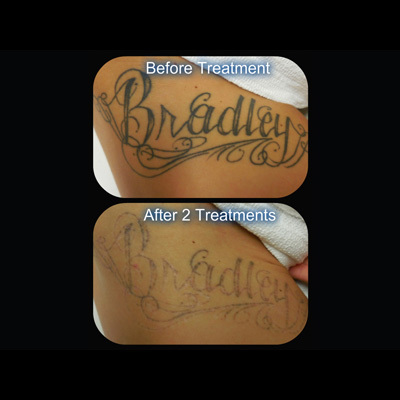 When a tattoo is applied, different sized particles are placed beneath the dermis, which remain a liquid. From the second the tattoo is applied, your body acts as if it is a foreign agent and tries to rid of the ink and never stops. If the particles of ink are small enough for your white blood cells to encapsulate, it will and the cell will carry the ink through your system harmlessly and carry it out of the body through your waste. This is why tattoos fade over time; the sun causes the ink to break down very slowly. When using a laser, the beam of light energy hits its target with heat and causes the ink to harden and expand. When it expands it shatters into smaller particles and are then absorbed by your white blood cells and carried out of your body. Multiple sessions are required for lightening and complete removal of the ink but the older the tattoo, the faster it usually is to remove because your body has already rid of some of the ink density naturally. Keep in mind it is normal for a tattoo to take 4-15 sessions to remove. 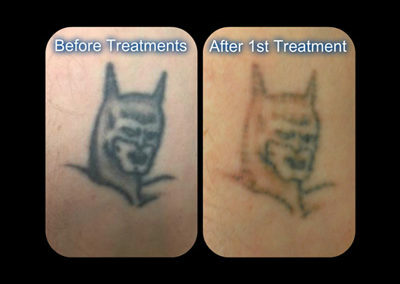 If you think laser tattoo removal is for you, please call us to set up a complimentary consultation so I can answer all of your questions and concerns. There could be some discomfort, blistering, bleeding, redness and swelling to the area for approx. 7 days following each treatment. It is all common and blistering is even a good thing as long as you keep the blisters in tact. When the skin blisters it fills with white blood cells, if you allow it to heal, all of the white blood cells will push back through the dermis grabbing any excess particles on its way back thru. If you puncture the blister, you are not utilizing the cells and you are also inviting an infection to the area. We will supply you with aftercare instructions and if you have questions after any treatment and need to seek advice, email jamie@redimedihealthcare, if you can't reach us by phone. Remember having good circulation is a big factor in the results you get. The further away from your heart, the more sessions it usually requires but there are ways to help the blood flow to all areas. Exercising is the best way to increase blood circulation and we will discuss other options during your consult. No, we always offer complimentary consultations for clients interested in tattoo removal. Cost depends on the size and color of each tattoo. Our prices start at $99 a session for a 2x2 square inch all black tattoo. Green and blue take the longest to treat during a session so they are more costly and are also the hardest to remove, but we do have the technology to remove them. It will feel like you are getting snapped with a rubber band repeatedly, but it is extremely fast. It will take approx. 1 minute to treat a black tattoo that is the size of an orange. What should I do to prepare for each session? Please shave the area and about an inch or two outside the tattooed area. 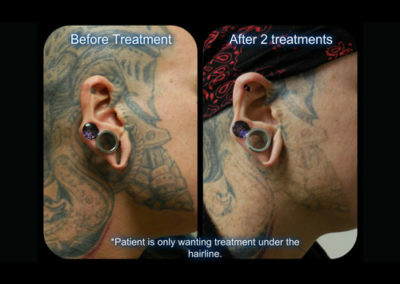 We will apply Tegaderm to the area after treatment and shaving the area will make for an easier application and removal. If you don’t shave, you can purchase a razor for $5 at your appointment. 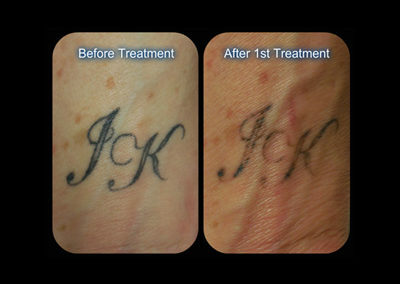 You can have 3-4 sessions to lighten for a cover-up tattoo or more to remove fully. Number of sessions depends on ink density, age of the tattoo, quality of ink, color and quality of tattoo (homemade vs shop and also the style of artist). If the artist applies the tattoo very deep, it is harder to remove. 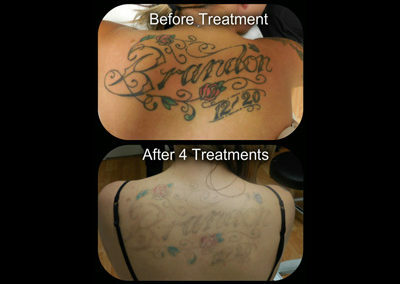 Removing a tattoo completely does take time and patience, and many tattoo removal businesses over-promise. A black tattoo that is 10 years old located close to the heart on a healthy, young patient will take only a few sessions, while some newer, more colorful tattoos may take up to 15 sessions. We’ll give you the straight scoop in our free consultation. What methods are available for the removal of tattoos? • Excision: Where a dermatologic surgeon removes the tattoo with a scalpel and closes the wound with stitches. In some cases patients would require a skin graft from another part of the body to help heal the area. Although the procedures above are still used around the globe, laser technology has become much more prevalent. Lasers (Light Amplification by the Stimulated Emission of Radiation) have now become the most common treatment for tattoo removal. 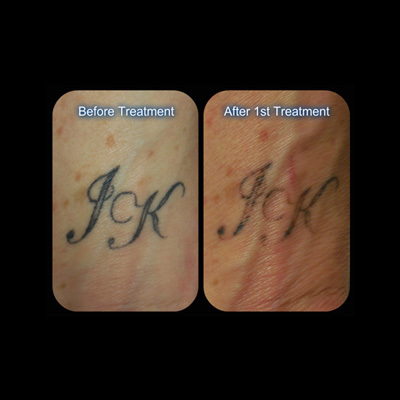 Laser technology offers a bloodless, low risk, effective alternative for complete tattoo removal with minimal side effects. 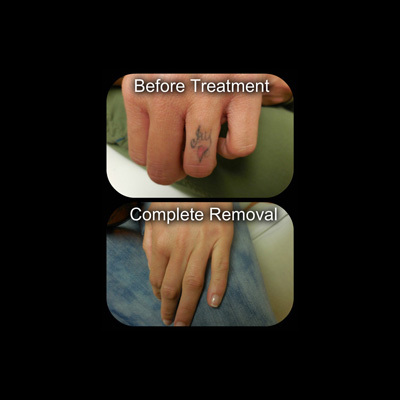 The number of treatments required for laser tattoo removal depends on many factors such as the age of the tattoo, where the tattoo is located, the amount of ink in the tattoo, the color of the tattoo, whether the tattoo is a professional or amateur one, and how quickly the client can heal. When researchers developed lasers that emitted wavelengths of light in short flashes called pulses, the medical use of lasers became viable. Advanced laser technology can effectively remove tattoos with a low risk of scarring, according to the American Academy of Dermatology. The type of laser used for tattoo removal depends on the tattoo’s pigment colors. Generally, yellow and green are the hardest colors to remove; blue and black are the easiest. Can your laser remove all colors? Yes. The Quanta Q Plus C is an FDA approved laser to remove tattoo along the full color spectrum. It has 3 different wavelengths built into the unit which allows for all colors to be removed safely. Can I just get a few sessions before I get a cover up? Absolutely. If you are going to get a new tattoo over an existing tattoo, you would only need a few sessions (usually 2-5 sessions) done to get the tattoo lightened up for a quality cover up. Life is too short for bad tattoos. 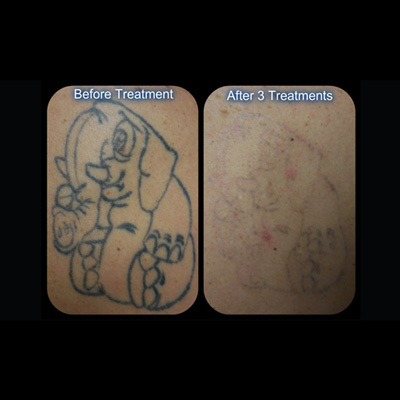 With pre-cover up laser treatments, you give your tattoo artist a much better canvas for that perfect tattoo. Can I get a tattoo removed and have a new one put on the same area? After a tattoo is removed a new one can be placed in the same location. Proper treatment leaves the skin in its natural state as if the tattoo was never there as long as you follow the aftercare instructions. Please note that if the artist scarred you during the application, most likely you will be able to see that scar after the ink is gone. Is the laser being used FDA approved? 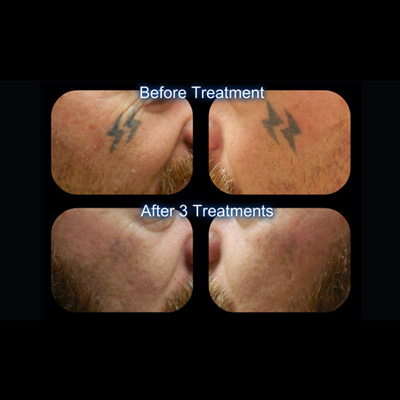 Our lasers are manufactured by Quanta USA and are FDA approved for the removal of tattoos. 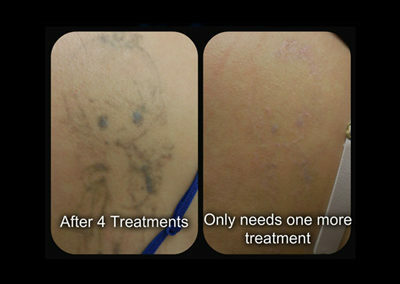 The Quanta Q + C is the “Gold Standard” in laser tattoo removal. Many otherlasers are made in China and are not FDA approved or are not the right type to remove tattoo ink. It is very important to be sure you are being treated with a Q switch or faster laser, that the wave length is appropriate for the color of ink being removed, and that the technician knows how to use the laser appropriately. Are your laser technicians certified? Our laser specialists are trained and certified to operate the laser. Our laser technicians studied at LR Laser Consulting, Spectrum Advanced Aesthetics and at Rocky Mountain Laser College. Their training includes laser physics, general use of medical lasers, specific use of the Quanta Q +C, and in safety in the use of medical lasers. Do your laser technicians work under a medical doctor? Yes. The state of Oregon requires laser technicians to operate under a medical doctor. 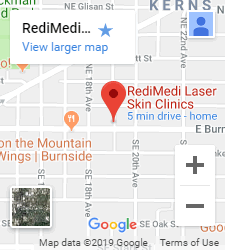 All treatments and treatment procedures at RediMedi Laser Skin Clinics are under the supervision of Dr. Glen Patrizio and Dr. Shena Vander Ploeg. Expect some pain with tattoo removal. Depending on the size of that tattoo you may expect more or less pain. RediMedi Laser Skin Clinics uses a Cryo which is a machine that blows cold air at -30 degrees. This helps create a numbing sensation on the skin and helps manage the pain. Most patients report that the pain is only very brief and quite tolerable. For patients who wish we offer advanced patch technology. Typically about 4-6 weeks. This depends on where the tattoo is on your body, your health condition, age and whether you are a smoker. Most tattoos will clear all the way within 4-15 sessions, this again depends on a few factors listed above. If you just want to lighten, we usually suggest 3-4 sessions typically. If the tattoo is light and pretty faded to begin with, it could take 1-2 sessions to get a better quality cover-up. With the technology these days there is little to no scarring once the removal is complete as long as you take care of it. This means leaving your blisters and scabs alone! Absolutely! We can get as close to untouched lines without ruining the other tattoo next to it. If there is a lot of shading and/or the tattoo is really old you most likely will see a difference in the first few days. I always suggest taking a picture right before the next session and looking at them side by side to see the real results. When you see it everyday it may not seem like a huge difference but when you have them side by side you cant deny the change! If you have hair in the area we suggest you shave. The hair can lessen the lasers energy a little bit and we want you to get the most effective treatment possible. Moisturize! Keep the area moist with some type of healing lotion such as calendula, Neosporin or anything of sorts. After care is simple. We will apply a small amount of aloe and lidocaine to the area and immediately put Tegaderm cover over the area. This will stay on for 4-6 days. You can shower and go on with your daily activities because the Tegaderm is waterproof and breathable. Do not take a hot shower for 2 days because it can irritate it and working out is suggested to wait at least a day. When you take the Tegaderm off after a few days it should almost be healed, you then start applying calendula or Neosporin multiple times a day and don’t let it dry out. Continue use at least once a day once healed until your next session. What payment do you accept? Do you offer financing? We accept cash, credit, debit and DocPay. Docpay is an interest free program that takes the amount you want out each month allowing you to get your sessions monthly without the financial pressure.